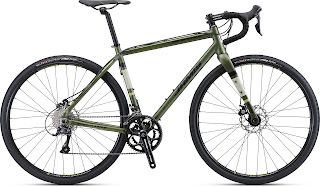 Century Cycles Blog: Enter to win a Jamis Renegade Explore Bicycle! Enter to win a Jamis Renegade Explore Bicycle! In the market for a new bike? How would you like to WIN one AND help out a great cause at the same time? This August, Team Left Hand/Century Cycles will once again be riding in the Bike MS Buckeye Breakaway. To help the team's fundraising effort, Century Cycles is raffling off a 2018 Jamis Renegade Explore bicycle valued at $999.99. Raffle tickets are $10.00 each, or 3 for $25.00, and can be purchased at any of our three stores. The drawing will be held on or around August 2, 2018, and the winner does not need to be present. The winner will get to choose the right size bike for them! The Jamis Renegade Explore is a versatile adventure bike that can carry you over all roads, whether smooth or rough, paved or not. It's got a lightweight aluminum frame and carbon fork with room for up to 700Cx42 or 650Bx47 tires; plenty of mounts for water bottles, cargo cages, racks, and fenders; disc brakes; and a Shimano 2x9-speed drive train. By purchasing a raffle ticket, not only will you get a chance to win an awesome bike, but your raffle dollars will go towards fighting Multiple Sclerosis! That's a win/win for sure! So stop in any of our three stores today, enter to win, and help us #CrushMS!